Bottles can be a challenge to wrap. 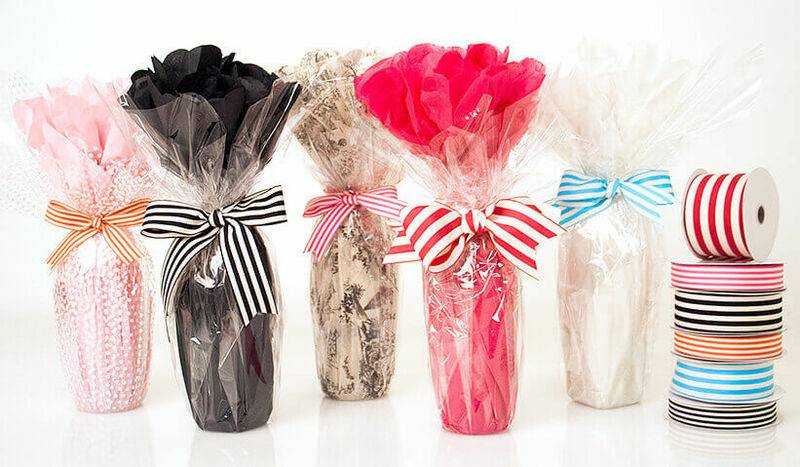 Nashville Wraps carries some wine bags, but for the do-it-yourselfers out there who want to create more of a personal touch, try this pretty bottle wrap idea. Start with one piece of tissue paper folded in half. Working with the shorter side, make 1.5″ accordion folds, then fold this bundle in half and hold the two ends together. Trim off the ends in a rounded shape (or in a point if you’d like a spiky-looking tissue pouf). Pinch the center fold together and wrap it with a twist tie, leaving one end of the twist tie longer. Fluff out the folds and scrunch up the gathered end so it holds together a little better. Get a piece of tape ready, then position the neck of the bottle in the center of this fold and angle the tissue pouf so the fluffy side points upward. Tape the twist tie to the bottle neck. It’s OK if it won’t stand up straight yet. Next, open the other two sheets of tissue. Lay the first one flat in front of you (if you’re using printed tissue lay it printed side down), and lay the second one on top, but angled so that the corners form points. Stand the bottle in the center and fold each outer corner of the tissue upward, gathering everything around the neck of the bottle. Secure it with another twist tie. Now unroll the cello and set the bottle in the center. Cut a big enough piece so that all the corners will reach to the top of the bottle, then pull all the corners up and gather them around the neck of the bottle. Secure with another twist tie. And finally, choose a ribbon to wrap around the neck of the bottle. If you like, add a few artificial flowers or a gift tag. Watch the video below to see just how easy this is! Love this! Looks great and love the extra fluff on top- makes a great presentation. I am going to have to try to practice that bow making too- Just love that this didn’t take a ton of materials to complete either. So pretty! I bet a couple of 18×30 clear cello sheets would work too.